We now understand that having koinonia is essential for the true New Covenant life and for fulfilling The Great Commission. In the New Testament when someone believed in Christ, they were made disciples, not just converts, and their discipleship began with being “added to the church.” This was far more than just being added to the membership roll. Every part of the New Testament body of Christ is called to be a functioning part of the body to which they are connected. They have a role to play in the life of the body. It is hard for anyone to discover their gifts and callings in the typical church service, much less have a place to function. Again, these larger services can have an important part in the life of the body, but the real building of the church, which is the place where church life really happens, will be the smaller groups. Many Christian leaders are fearful of special “clicks” forming from small groups. This can, and likely will happen. But it is part of the maturing process that they will grow beyond if they have a secure and healthy leadership. Our human bodies are formed this way. All of the cells that are meant to be heart cells need to be connected within the heart, and the heart must be connected to the rest of the body, if it is to live. If we are overly fearful of small groups separating themselves, then we are not mature or secure enough in the Lord to be in leadership. Without a leadership that walks in faith instead of fear, koinonia will not happen. Without the freedom present that enables some groups to separate, the control spirit will be too great for authentic koinonia. Therefore, a secure and mature leadership is crucial for church life. All relationships go through phases and challenges before becoming mature and stable. Churches do too. If we think that we will wait out the problems and jump in when things settle down, we will not fit in when we try to jump in. The process is essential. 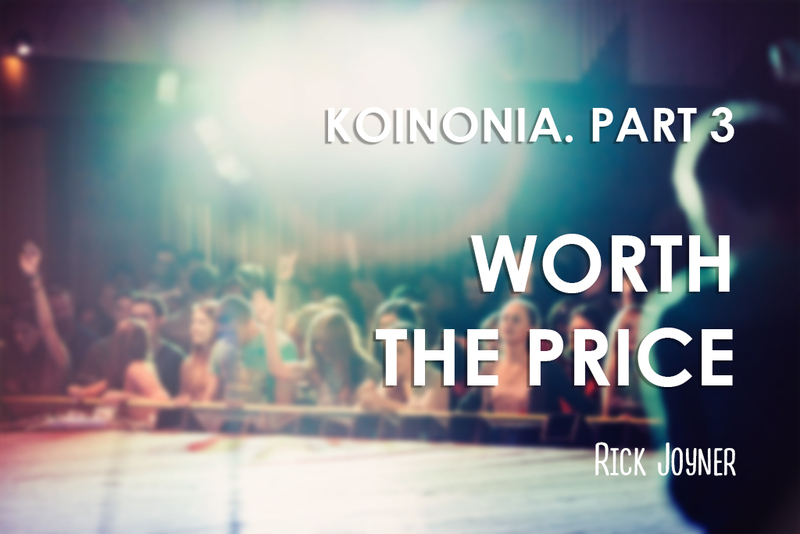 The more intense it is, the greater we can expect the purpose and koinonia to be. As we enter more deeply into the time when all of society is falling apart, the koinonia in the church is going to be a strong lifeline to many and become one of the most valuable treasures on earth. It will be well worth whatever price we have paid for it.